Question: I was on the river the other day, and this guy downstream from me was catching a lot of fish (way more than me). I noticed that whenever he set the hook, he pulled his rod to the side, rather than going straight up with his rod tip, the way I was taught to. What was he doing? Answer: My guess is that he was using a sweep set. This is a useful technique when you’re either fishing downstream or have a lot of slack on the water—for instance when you’re making slack-line casts, such as a pile cast or a curve cast. Because there’s a lot of slack on the water, if you simply raise your rod tip, all you’re doing is picking up the slack. Depending on how much slack you have between you and your fly, you might never even put any tension on the fly itself this way. No tension on the fly often means no hookup. To make a sweep set, you sweep your rod horizontally toward the bank behind you, keeping the rod parallel to the water’s surface. At the same time, haul the line with your non-rod-hand. Always sweep to your downstream side. Otherwise, you’ll drag the line across your body, where it can get snagged by your vest/jacket or any tools you have hanging from it. Once the fish is hooked, you can raise your rod and start stripping like a madman to pick up the slack and establish a connection to the fish. Because most of us have been taught to raise our rod tip to set the hook, employing the sweep set requires concentration and discipline. I usually make a mental note at the end of every cast to remind myself what I should do if I get a strike. 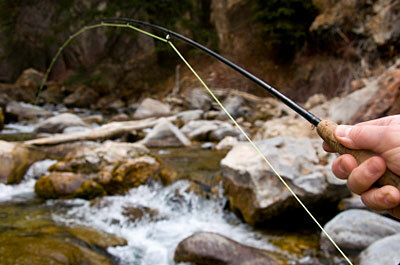 For more on downstream fishing and slack line casts, check out this previous column.